First of all, we can use “so” with adjectives. “So” gives meaning to the words which are expressed,“very” or “that much”. Tom seems so happy now. She was so sad when my grandmother died. I am so full. I can’t eat that. We can use “so” with adverbs. “So” is used to express “extreme actions” in the sentences. The teacher was speaking so loudly. They should run so rapidly. I am waiting you so nervously. We can also use “so” with “adjectives /adverbs + that” to explain the result. And also, it is used to indicate that something happens at extreme points. However, using “that” is not necessary. This machine works so loudly ( that ) I have a headache. “So” is used with “many/few” to indicate extremes in amount. They have so many childrens. There are so few cars in the parking lot. I ate so many hamburgers. “So” is used with “much/little” to indicate extremes in amount. The teacher gave so much advice to the students. I have read so much news about this issue. There is so little butter in the fridge. We can also use “so” with “many/few/much/little + that” to explain the result. However, using “that” is not necessary. The child had so many toys ( that ) he could not decide which to play. He eats so much sugar ( that ) he may be a diabetic. There was so much food ( that ) we couldn’t decide what to eat. We use “so much” with “comparatives” to express extremes. He looks so much cooler in the clothes. This athlete is getting so much faster. The sales figures were so much better than expected. “So” is used with “much/often,etc.” to express that how much or how often something is happened. I have drunk so much. We have slept so little. She wants to see him so often. 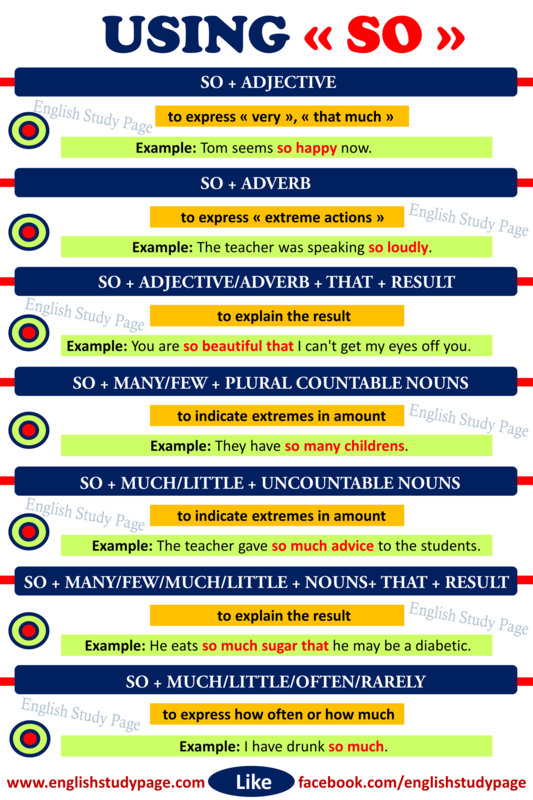 We can also use “so” with “much,little,etc + that” to explain the result. However, using “that” is not necessary. I ate so much that I am full. He was sending me messages so often that I took him out of friends list. 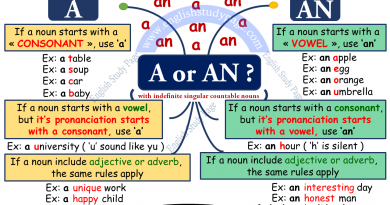 “So”, as a conjunction, is used to connect two clauses. The clause which start with “so” introduces the result of the first clause. They were tires so they went to bed early. I have some money so I want to buy a new car. He ran very fast so we couldn’t see him exactly. The clause , starting with “so”, can not come at the beginning of a sentence. “So + that”, as a conjunction, is used to make explanation about the clause or to express the reason of the clause. He wants to earn lots of money so that he can buy many things that he wants. I put my glasses on so that I could see the movie better. His father gave him some story books so that he could improve his reading. 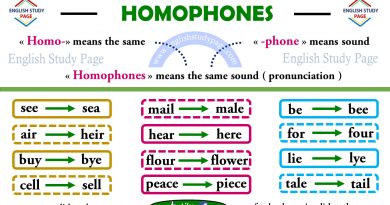 We use “so” with this method, especially in short answers, to avoid repetitions to mean “in the same way, as well or too”. A: He is a clever staff. B: So is Linda. John can swim very well, and so can his sister. His parents want his child to have a good education. So does every parent. 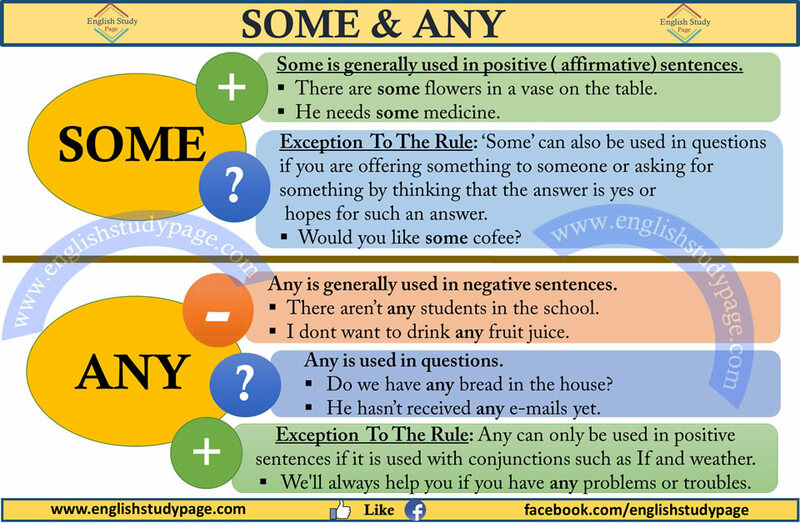 We can use “so” instead of repeating an object clause, also to avoid repetitions.